DKriderGZ hasn't been seen in the track making business since 7 July 2003. And has made his return after almost 6 years with this breathtaking track. It is possibly the greatest masterpiece since SP's Outback by OLD_mumhra. It is based off the area he was born (Chagrin Falls Ohio), and adds mountains to the track, which without question add to the beauty of this track. The race starts in a town, but immediately you will find yourself in the valley of the mountains. Before reaching the mountains themselves there are some fine jumps, corners which will catch you out if you are not using the "tab" map, and some dirt trails you must take because of the main road being blocked with roadworks. I really recommend you break through into the roadworks when you are not racing, because they are fine to look at. Once you reach the mountains, prepare for some fast driving, but watch out for edges of the path, where you sometimes must turn to the left of right to make it to the other side, or will just hit the mountain face. 3/4 of the way through the race, be prepared to get wet! As you go through (yes though) a waterfall, and underneath it. Unfortunately, the checkpoint (15) on the other side of the waterfall can catch you out, you must stay to the left of the waterfall to successfully make it through. Near the end, you will find yourself back at the small town you started from. This takes over some rooftops, then back down to the ground, through a car park, and back to the line. Once again, I recommend a look through the town, as there is plenty to see. I was sure we were going to see a long circuit or rally track sometime this year, but I sure wasn't expecting to see something this amazing! DKriderGZ you have utterly outdone yourself with this absolute masterpiece of a track. One of the best tracks (not just circuits) ever. A message to everyone: YOU NEED THIS TRACK! Roadknight is correct, you need this track. Its already on my favorites list. However, I ran a 3:28. :p 1600 Medium Cut, Soft Suspension. However, I ran a 3:28. Well, we just gotta brag. Lol, this is a sweet sounding track. I haven't ran it yet, but I figure since I have some free time, why not download it and try it. Awesome track! really challenging, jam would love it. I agree. This is the best circuit I have ever raced on. Kmaster, you have to show him up on your new rally! Lol. I can get in the low 3:20's, if I pushed it. ^^^ There's a list of SP's Saturday races for this month. Yep Jams is right I totally loved this track, challenging and interesting. A total blast! Glad you liked that Roadknight I so enjoy the long tracks. Last edited by ShadowPrincess on Thu Apr 09, 2009 10:33 pm, edited 3 times in total. Thanks guys for all the great comments. CP 15 was giving me alot of probs, couldnt get it perfected. I got ya beat.. 3:15, but I can't stay consistant lol. I fall alot everywhere lol. I wanted to make it hard, all of my old tracks were easy. I'm glad you all enjoy it, and I appreciate you downloading it and your feedback. I really missed this game and I am glad to be back into it. Thanks for the honor of hosting my track. You can bet on me being there Sat SP! BUT, not as fast as DK. Theres a short after CP1, its hard though. Thats all I am saying lol. Nice lap. Im sure if I wanted to, I could get in the 3:10's, but, nice lap time. After I've had alot of comments, and have had a few people tell me I should rerelease the track with a CP15 fixed, I have since thought of an e-z fix (put a CP under the cave) and am curious if this would be a bad idea? I will be sure to change the pod name and zip file. I just don't want it to be an incovenience to people. I really hate doing this, but i want this track to work for the tourney tomorrow. DK it will be fine as it is. If you go straight through the tunnel on the race line the cp trips every time. It is even tall enough that you should be able to get it if the heli drops you on the roof. Doing laps without A.I. trucks = epic fail. SP, ive had a few others tell me differently, that is my problem. That could really ruin a race. I want difficulty, but not game errors. If you want to keep it like it is we can, but its not a big deal to change it either. Will only take a few seconds. You doubt my ability to cheat? 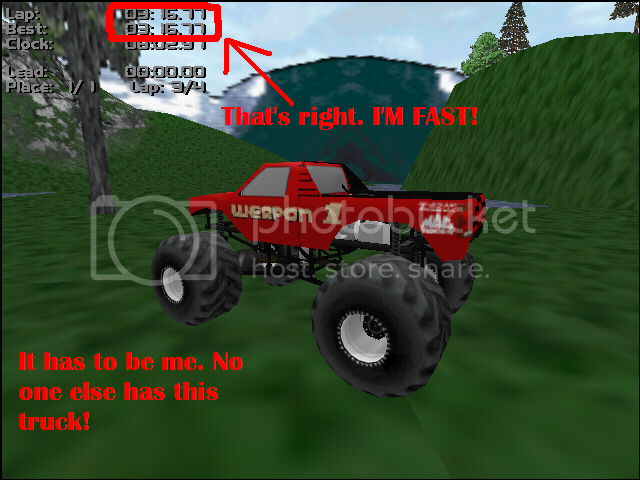 I'll have you know I was a master mtm2 cheater back in the day . I spent lots of time developing cheats that could beat Steve. Granted I've since lost all those cheats about 6 computers ago... And was only able to make them using Win95's unique hex and text editors along with memory injection API. Yes you were. I wonder if any of you know who was Steve.